Fette Sau? Translation: "fat pig" in German. Brilliant. Vegetarians this is not for you. By now most New Yorkers agree that the Brooklyn food scene has been in full swing for some time and is showing no signs of slowing. Though I want to show Manhattan some love, I keep coming back to Brooklyn for the food. We drooled over the case of meats before ordering 1/4 of a pound of four meats; brisket, pork shoulder, pork belly and pulled pork, some sides of baked beans, potato salad and a couple of Guss's half sour pickles. They loaded us up with four soft yellowy rolls that reminded me of school lunch (in a good way). The Craft Beer list is extensive and they try to stick to as much local as possible. They boast the best American whiskey list in New York City, with flights of scotch or whiskey available for the brave at heart, definitely not for me! We stuck to two pints of Captain Lawrence Liquid Gold and Coney Island Mermaid Pilsner served in mason jars. The beer is available in 1/2 pint, pint, quart, 1/2 gallon jugs or gallon jugs. The whole place has a bit of a secret moonshine making quality to it. On this particular evening Fette Sau was full of guys sharing a meat/whiskey camaraderie. This is where the bromance and the man dates happen! The crowd was a good mix of hipster to old Brooklyn to young a dad with his newborn baby strapped on Bjorn-style getting his meat fix (or his baby's momma meat fix). I came back on a friday night and the ratio was much more even, there were many more couples, obviously comfortable with eating piles of meat together! The meat was perfectly cooked, smokey, a little spicy and not at all dry. Our favorite was the peppercorn-crusted brisket. We made sandwiches of the pulled pork and loaded them up with sweet sauce, vinegar sauce and hot sauce. I was partial to the ketchup based sweet sauce, a little spicy and a little sweet. Barbecue is very regional and different from place to place. My friend, a native South Carolininan, was telling me that all the Fette Sau barbeque is dry rubbed and smoked as opposed to South Carolina barbeque which is mustard based, Eastern North Carolina which is vinegar based and Western North Carolina is tomato based. 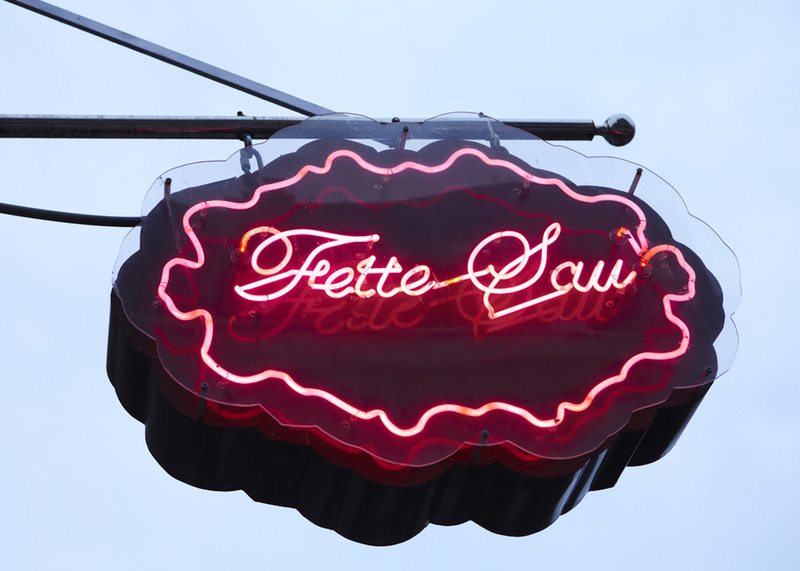 The smoking and the rubbing at Fette Sau takes place out back. They smoke with a blend of Red and White Oak, Maple Beech and Cheery, all locally sourced. 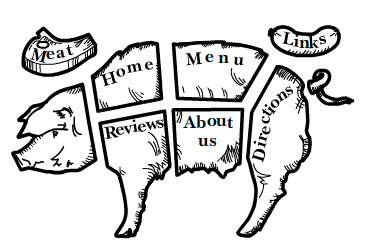 The meat is all organic and or small family farmed heritage breed animals. The sides were deliciously perfect as well, the beans a little smokey and a little sugary and the potato salad was of the German sort with mustard seed and vinegar. They guys next to us were fighting over the last pickle on their tray as Elvis crooned "It's Now or Never" in the background. "Dude that was mine...get your own damn pickle!" Wow. Pickles and barbeque that bring men to blows... This place is the real deal. We finished up with a slice of Steves key lime pie, because I am nostalgic and have lived in New York long enough to remember when this guy and the artists were the only thing happening in Red-hook. We used to drive out to his bakery on the pier to buy his pie. If you haven't tried his pie, and you love key lime, you must! We each left a full half pound or so heavier (and then some!) than when we had arrived, and we we were ok with it. In fact we talked about the next time when we could come back for some ribs!